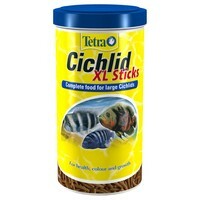 Tetra Cichlid XL Sticks (previously DoroMin) are staple food sticks for all cichlids, containing specific ingredients to meet all cichlids needs. The sticks float on the surface of the water and suit the natural eating habits of the fish, due to their shape and size. The sticks are large to ensure easy feeding. Stabilised in vitamin C helps promote healthy growth and prevents nutrition related deficiency and disease.